Nobody cooked like my grandmother. This is not an exaggeration. Nobody COULD cook like her because she never used a recipe and didn’t have anything written down! 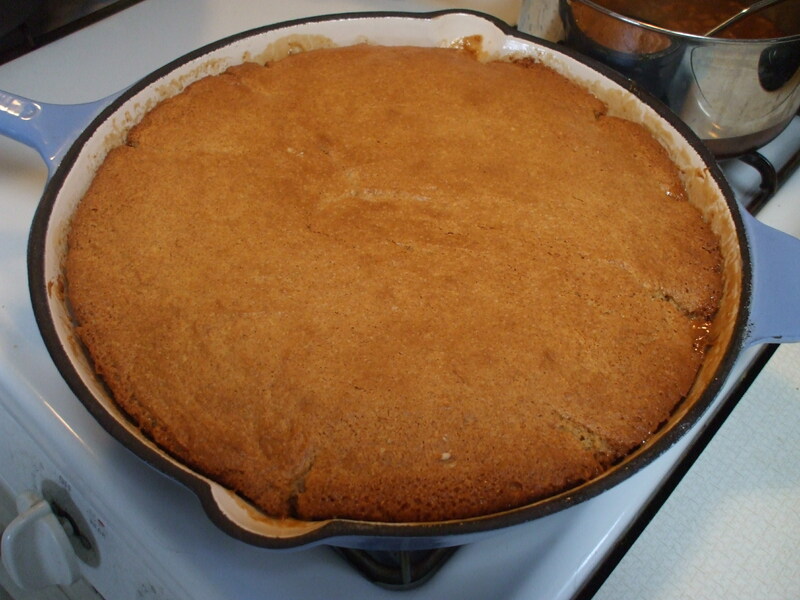 I can still taste her biscuits though, and her blackberry cobbler…yummmmmmm…everything made in that old black cast iron skillet. I’m telling you, that was the only pan I ever remember seeing her use. Hers was so well used you could see your face in that shiny black skillet. When I learned to cook from my mother that was what she used as well. I still chuckle when I remember the reaction of one of her friends when one of the dishwashing crew at a church potluck decided to use a Brillo pad on her favorite skillet. I was afraid murder was going to be done right there in front of God and everybody! Then along came Teflon and the old cast iron skillet disappeared. Then we went with stainless steel. Don’t even ask me how hard THAT was to get cleaned. So here I am, back with the cast iron in my kitchen. Not just any cast iron. I got a beautiful baby blue enamel coated cast iron skillet! Boy is it pretty! 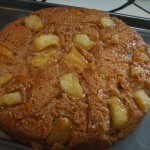 I decided to put it through its paces and see if it really was as good as the guy selling it to me said it was..*cough cough not to mention any names…Cecil* I had a recipe that I had been wanting to try so I pulled it out and began to make what looked to be a scrumptious caramel-apple skillet cake. 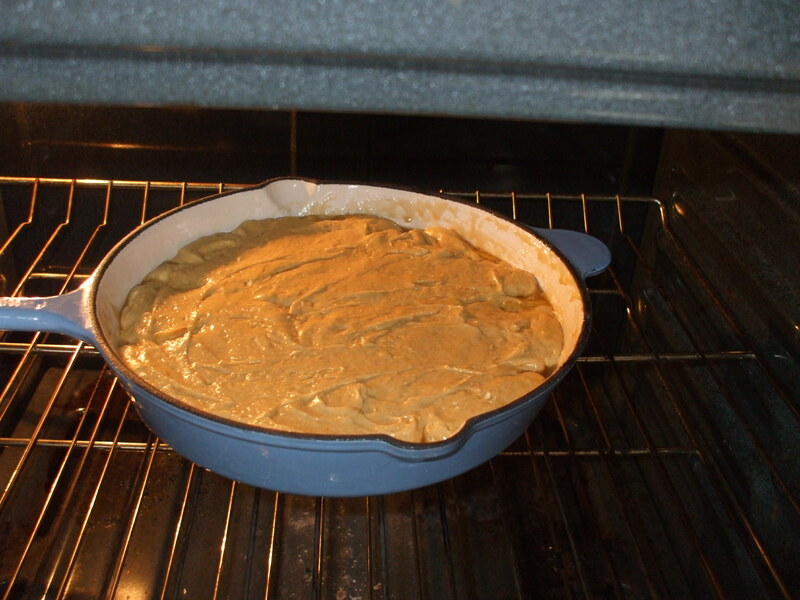 This required cooking on the stove and putting that pan into the oven. Scary…. As you can see in the pictures, it turned out fabulous and tasty! 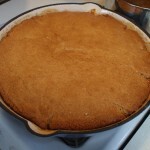 The pan cooked and baked beautifully and the clean-up was a breeze. 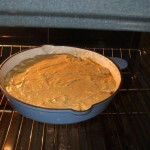 Now the enamel coated cast iron is a little pricey but there are real advantages to this product. You don’t EVER have to season the pan or worry about the finish. This means you can scrub the pan with whatever product you use without ruining the finish. The base doesn’t discolor when used on a gas stove, which was another concern of mine. The heat conduction is the same as the original cast iron. Just a note here, when you pick up the skillet to put it in the oven…be sure and use mitts or those handy covers. The heat conduction is so great that the handles get very warm. My skillet went from stove burner to oven with no problem at all. I was worried about the enamel finish but it came through unscathed! Preheat oven to 350F. 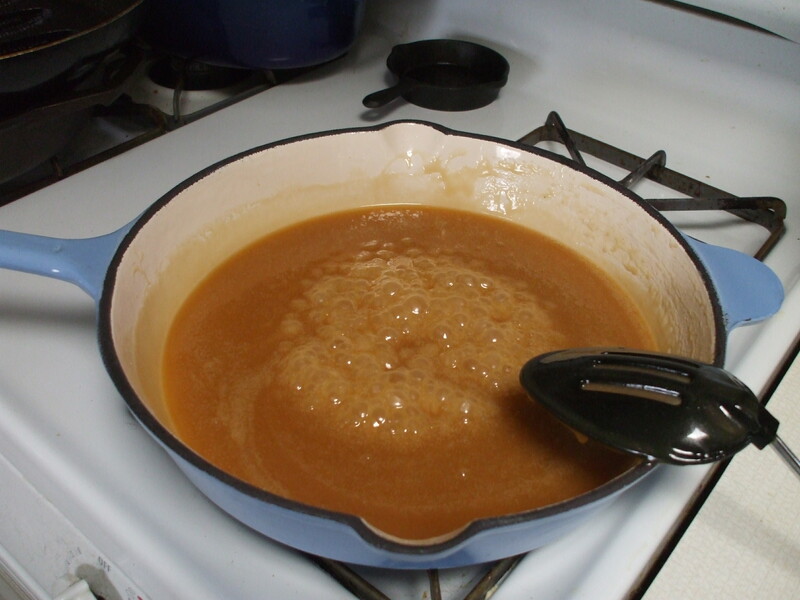 Heat butter, sugar, cream and corn syrup in 11 in ceramic skillet (I used a 12 inch enamel coated skillet) over medium heat until simmering, stirring until smooth. 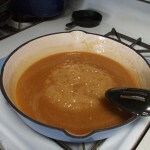 Cook mixture, uncovered, another 7-9 minutes or until mixture is thickened and slightly darker in color, stirring occasionally. Remove skillet from heat. 2. 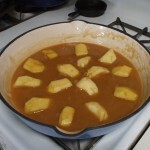 Meanwhile, cut apples with apple wedger and set aside 5 of the wedges. 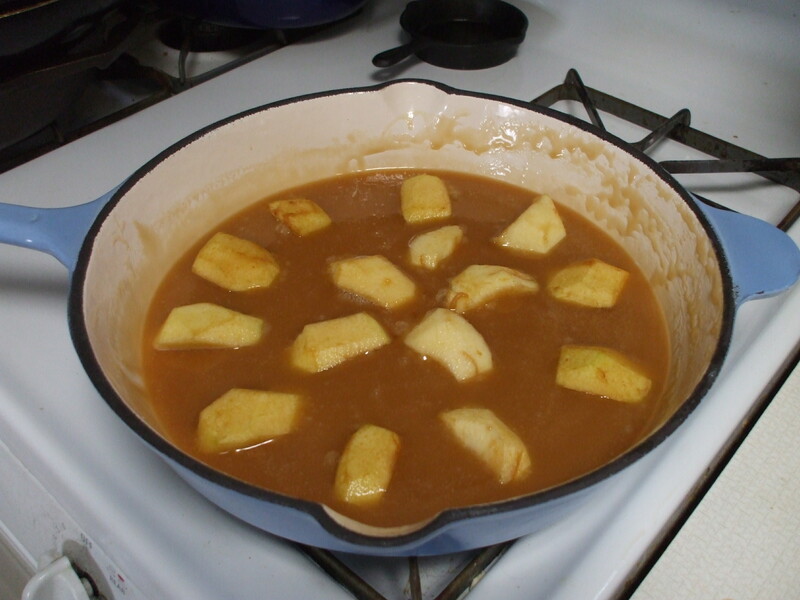 Starting at the edges of the skillet, carefully arrange apple wedges, cut side down, over caramel. Arrange the remaining 5 wedges in the center. A couple of things-you can substitute Fuji or Honeycrisp apples for the Braeburn. It calls for small apples. When I do it again, I will use larger apples. The small ones don’t fit into the wedger evenly and I would like more apple flavor I think. Be very careful when you spread the batter. 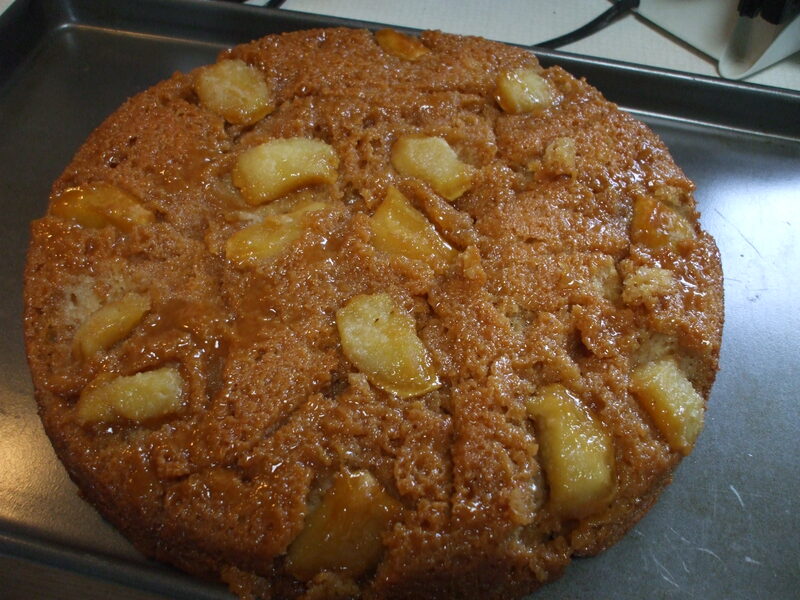 It is really thick and as you can see, tends to mess up the pretty pattern of the apples when you spread it. Now, enough of the details. Who wants cake?? Heya i am for the first time here. I found this board and I find It truly helpful & it helped me out much. I am hoping to provide something again and help others such as you helped me. Heya i am for the primary time here. I found this board and I in finding It truly useful & it helped me out much. I’m hoping to give something back and aid others such as you aided me. Magnificent points altogether, you just received a new reader. What might you suggest in regards to your publish that you just made a few days ago? Any sure? I just want to tell you that I’m very new to blogging and site-building and actually liked your web site. Very likely I’m likely to bookmark your site . You surely come with good well written articles. Thanks a bunch for revealing your blog site.